“It’s a privilege to be here in the making of this historic event and work with these women to fully empower them to pursue their highest vision, aspirations and ideals,” says Marga Fripp on her first day in Papua New Guinea after meeting with the most vibrant and determined women of PNG. Marga will have the opportunity to witness the launching of the Papua New Guinea Women’s Chamber of Commerce and Industry (PNGWCCI) on Wednesday, Nov 6th. The First Lady of PNG, a businesswoman herself, and the most influential change maker women of the country will attend the event, and Marga will be the keynote speaker. It’s an exciting time to be there for Marga as the event symbolizes the fruition of a women-led social movement after year’s worth of struggle to achieve empowerment, political representation, financial and economic independence and much more. The organization will create an opportunity for women to voice their concerns, to engage policy makers in addressing the most volatile social and economic issues that are preventing women from achieving success and empowerment. All women in the middle are the founders of Papua New Guinea Women’s Chamber of Commerce and Industry. Left to right Natalia (US Embassy), Theresa, Linda, Avia, Amanda, Janet, Susan (US Embassy). Marga’s role in PNG, besides coaching and mentoring entrepreneurial skills, is to inspire and encourage women to speak up about their concerns, obstacles, drawbacks and doubts that are hindering them from achieving their goals in life. It’s conventional wisdom that change can only come when we identify our stumbling blocks and when we make the effort to address it to whoever is willing to listen, and with 20 plus years of experience under her belt Marga knows that the most important step in achieving change is to listen first. These are extraordinary women with extraordinary stories to tell and they represent not just women in PNG but women globally. This is how Marga felt on her first few day in PNG. “I met some of the strongest and most determined global women. 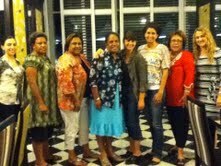 I had dinner last night with the founders of the first women’s chamber of commerce in PNG. Much like at EWI we shared our stories, and how we have been helping immigrant, refugee and low-income women become self-determined and empowered entrepreneurs through our rigorous 3-month ETS programs. The women I met are determined to change the status quo, they are women of change, they know where they came from, they sacrificed a lot to become who they are and they are now paving the way for other women and generations to come.